Big Whiskey's American Restaurant & Bar is making a big impression in casual dining, poised to hit the road to nationally expand the legend of the beloved brand. Fueled by record setting sales, new markets, and a flurry of corporate and franchise development deals, Big Whiskey's is riding a wave of momentum as an emerging brand with a winning blueprint for expansion, notes Austin Herschend, president of Big Whiskey's American Restaurant & Bar, operators of eight restaurants in Missouri and Arkansas. "In an industry where everything has a tendency to look the same, Big Whiskey's stands out," remarks Herschend. "We have done an excellent job in bridging the gap to be a place for both the Millennial and Generation Xers. We're passionate about what we do and the details matter to us. Each franchise store is treated as if it is our own investment." There's a lot to love about Big Whiskey's and its mantra "where traditions are just as important as trends." Founded in downtown Springfield, Missouri in 2006, the brand has long been a casual dining mainstay in Southwest Missouri, known as a unique gathering spot for great food, good times, and superior customer service. The restaurant serves up a premium menu of hand-cut steaks, craft burgers, pastas, appetizers, salads, soups, and sandwiches, with a full bar of more than 100 whiskeys and 20 beers on tap. "Big Whiskey's is something different to each of our customers," explains Herschend. "For some, we are the date night place, others we are the happy hour hangout, family dinner place, business lunch and, finally, the best place to watch the game. We describe ourselves as the anytime, every time place. Most importantly, we are restaurant first, but we celebrate our bar and sports products." Big Whiskey's unique mix as a restaurant and bar with a loyal following made the decision to franchise the concept a no-brainer. In 2017, the chain opened the first franchise locations in Bentonville, Arkansas and Lee's Summit, Missouri, and inked multi-unit development deals for Las Vegas and Birmingham, Alabama. The brand is also committed to corporate growth. Big Whiskey's opened its first company stand-alone restaurant location last year and is hatching plans for "our largest investment to date" in Overland Park, Kansas this summer, Herschend says. "Last year, we experienced record sales for both corporate stores and opening sales for our new franchisees," says Herschend. "100 percent of our corporate stores were up, year-over-year, in a year where most industry saw a decline." Franchisees are finding Big Whiskey's a solid franchise investment with a strong ROI, low cost of entry, and multiple ways to build the bottom line. The brand boasts a "4-Opportunities Method" of multiple revenue streams with lunch, dinner, happy hour, and late-night service, notes Herschend. 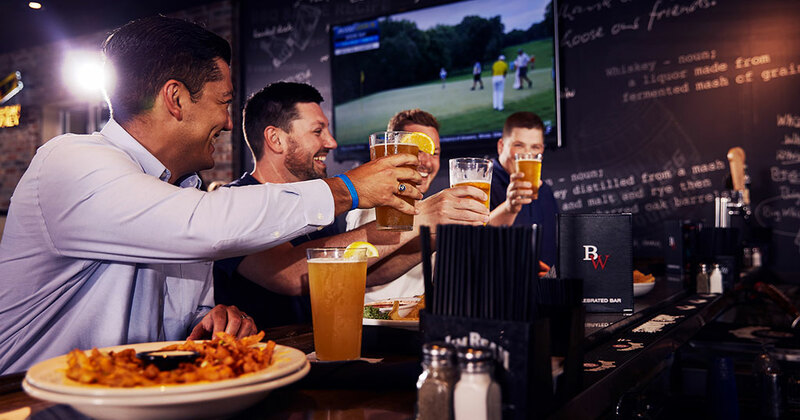 With a strong franchise support system in place and a proven history for success, Big Whiskey's is set to grow in new markets with a unique formula for dining and entertainment. The company is seeking franchise partners for the "community first" brand who are passionate about the communities they serve. Herschend sees a bright future for Big Whiskey's, whose foundation was inspired by middle America's "little corner tavern," where story-telling regulars become legendary customers and a great toast is part of the brand's DNA. "A great toast is part of our story. The Legend of Big Whiskey," reveals Herschend. "We think a memorable toast is about reflection, passion, and people, with glasses raised at the right time and right place. That is how we built our concept. Big Whiskey's is always the right time and right place for food, drinks, sports, and being social."